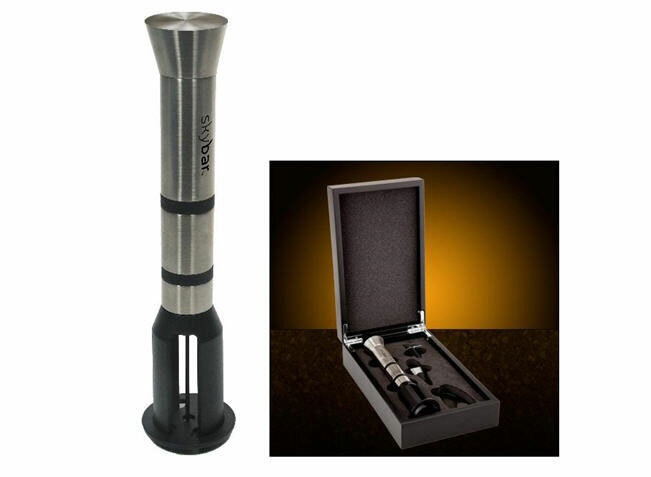 On March 9th, 2011, The U.S. Consumer Product Safety Commission, in cooperation with Sunbeam Products Inc, announced a voluntary recall of their “skybar™ Air Pump Wine Opener” which was distributed by QVC . What should you know about this recall? Wine bottles can break when opened with the recalled opener, posing a laceration hazard to consumers. Sunbeam has received 52 reports of wine bottles breaking while the opener was being used on them, including 22 reports of injuries. Injuries include lacerations to the hands. This recall involves the “skybar™ Air Pump Wine Opener” model number NBSKWA2600. The wine bottle opener was sold as a four piece set in the following colors: gray, blue, red or silver and black-colored with a black storage box. “skybar” is printed on the side of the wine bottle opener. Model number NBSKWA2600 is printed on the bottom of the wine bottle opener. Approximately 159,000 of these wine openers were sold at QVC retail and employees stores nationwide, QVC’s televised shopping programs, and online at www.qvc.com and www.skybarhome.com from November 2010 through December 2010 for between $30 and $60. Consumer Contact: Contact QVC at (800) 367-9444 between 7 a.m. and 1 a.m. ET daily or visit the firm’s website at www.qvc.com. Consumers can also contact Sunbeam toll-free at (888) 759-2279 between 9 a.m. and 6 p.m. ET Monday through Friday, or visit the Sunbeam's website. Additional information can also be found at the U.S. CPSC website.